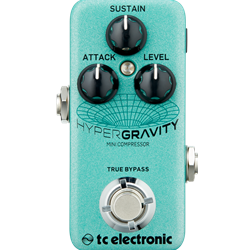 HyperGravity Mini Compressor is the worlds smallest multi-band compressor. We took all of the good stuff - performance, usability, even the green-sparkle paint-job - from our acclaimed Hyper Gravity Compressor and condensed it down into a super-compact enclosure. The result is an incredibly versatile guitar compressor with a ridiculously small footprint, meaning that you don't have to compromise on tone or pedalboard real estate.